There’s no doubt that Gmail is one of the most used webmail servcie in the world and that can do much more than just read and write emails. We use gmail to manage all our daily tasks and prefer it over any other email web service. Gmail is powered with lots of feature which you will enjoy on your inbox and helps to make it one of the best. In our previous posts, we discussed about lots of Gmail feature and tips which you will read here How to See When and Who Opens your Email, Quick Guide to Restore Deleted Contacts in Gmail, Get Rid of Unwanted Emails or Senders On Your Gmail Account, How to Change Your Gmail Email Address and Tips to Secure Gmail Account From Hackers. All the feature are easy to use, some of them you will use without using any addon or third party application. Today we are back again with some new Gmail tips and tricks, this time we will share some of the best keyboard shortcuts that can make your work even faster. Most of these keyboard shortcuts are new for many Gmail users. All these keyboard shortcuts will able to help you in many ways like open a new message, search, Select all messages, replies much more. 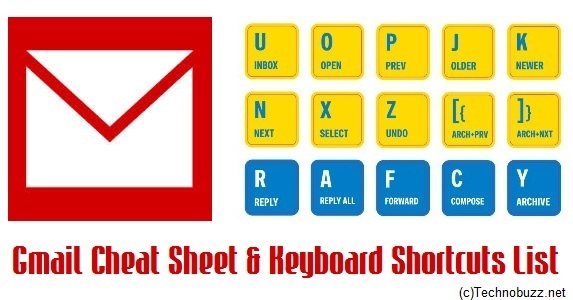 The below mention Gmail Keyboard Shortcuts and Cheats infographic is pretty simple and easy to use. Too apply all these shortcuts or trick on your Gmail account all you have to enable the Keyboard shortcuts on your Gmail Account. To do this click the Gear Icon in the upper right, go to Setting > General > Enable Keyboard shortcuts on. With the help of this Infographic you will enjoy your Gmail account in much easier and simple way. Hope the Infographic helps you to apply some new shortcuts and cheats on your Gmail Account. Looking for Gmail and Google tips and tricks, check out our Gmail Tips section here. From more update like our Facebook page here and add us on your Google+ Circles.